So which product is the best? 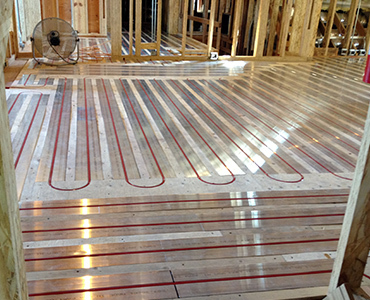 Should you install a hydronic heating system that pumps specially treated hot water through PEX tubing under your floors, an electric cable heating system, or a low-voltage system with flexible polymer heating panels? The answer lies in the type of project you are doing. No single system is ideal for every project, but there is an ideal system for every project. Hydronic floor heating is the oldest and most popular type of radiant floor heating. These systems are comprised of a boiler or hot water heater, pumps, manifolds, PEX tubing, thermostat, and advanced Rau Panels. Hydronic heating is the most complex of all radiant heat systems. These systems require trained professionals to design and perform the installation. Your best economies of scale are achieved for hydronic systems in large areas or entire homes because of their expensive components and installation costs. However, because hydronic systems can operate on natural gas, oil or propane etc., the operational costs can be a little lower than that of electric floor heating systems. Hydronic systems can be installed under any type of flooring. Most hydronic systems require hot water tubing to be installed in a 2-4 inch bed of light concrete or specially made panels, and are best installed during the initial construction because of its weight load demands and adjustments to floor height. Recent low-mass products have been developed to avoid these challenges by fitting the tubing into pre-cut Rau Panels, making hydronic systems more convenient and possible for most major remodeling projects. If you want to heat smaller areas like a bathroom or kitchen, a hydronic floor heating system may not be the best value for your project. The complexity and cost of installing the system, along with the long-term maintenance and up-keep required, is not worth the small amount you will save in operational costs. Electric floor heating systems are highly preferred over hydronic systems for small floor heating applications. Electric cable heating systems, often called line- or high-voltage systems, are gaining popularity and are ideal for heating smaller areas (10-300 square feet) like bathrooms, kitchens, and sun rooms. These systems are comprised of a thermostat and a heating cable. The most popular heat cable is Warmzone’s ComfortTile cable. ComfortTile floor heating systems feature heat cable that is available on spools as well as cable that is pre-spaced on a flexible mesh with adhesive backing for easy “roll out” installation. The cable on the spool is oftentimes less expensive, and gives you the ability to space the cable how you want and customize a layout that will heat every square inch of your floor. The cable in mats allows for quick and easy installation. Every available cable system is equally effective, so when determining which system to purchase, you should look at the warranty of the product, along with the ease of installation. Some cables must be embedded in a separate layer of concrete or mortar, whereas other systems can simply be installed in the thinset. Most cable systems can only be installed under tile. However, on others, if the cable is embedded in mortar or concrete, any flooring can be installed on top of the concrete. When heating smaller areas, it is nearly impossible to beat the simplicity and price of an electric cable heating system. Finally, there are low-voltage radiant heat systems. These systems are ideal for mid-size to larger areas (300-3000 square feet) and are comprised of a control box, transformer, heating screen or cable, and thermostat. A unique advantage to a FloorHeat low-voltage system is the extremely low profile of the heating element. 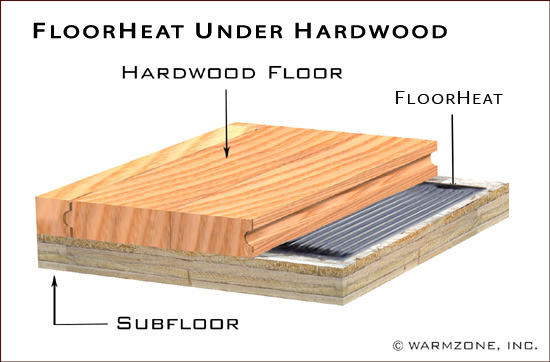 FloorHeat is practically paper thin and does not buildup floors during the installation. The floor heating system features a 12-inch wide, durable polymer heating element that is self-regulating. It can be installed directly under any type of flooring including hardwood, tile, laminates, and carpet. Whereas most cable systems must be installed on top of the concrete board when installing tile, FloorHeat can be installed underneath it. These systems are easy to install and don’t require maintenance like a hydronic system. The self-regulating capability of FloorHeat means that when the ambient temperature rises, the electrical resistance increases and the consumption of electricity decreases. For this reason, the element cannot overheat, and the system is extremely energy efficient. Radiant heat technology has made significant advances over the years and is an excellent way to supplement your existing heating system or be your sole source of heat. One good way to be assured that you’re being sold the best system for your project is to buy from a company that offers all of the available types of radiant heat. Warmzone is one company that carries a wide variety of radiant systems and is dedicated to specifying the product that makes the most sense for each individual job. Without a bias towards one system, and unmatched customer services (including installation support and free installation training), Warmzone has become a consumer advocate in the radiant industry that can save you time and money. Warmzone has already done the research and is committed to working with only the best products on the market. Because Warmzone is a leading nationwide wholesaler, you can receive the best pricing by purchasing direct. Receive a free estimate for your project by submitting a quote request or calling Warmzone at 1-888-488-WARM (9276).